Finally! Today Google has announced it will now let users get custom URLs. The only requirements are to have a G+ account for more than 30 days, have at least 10 followers and have a profile picture. If you don’t see the option yet on your Google+ profile or Google+ Page, don’t worry: Google says it is expanding availability throughout the week. Custom URLs are not wide spread on Facebook. If you don’t know what custom URLs (also called vanity URLs) are, here’s quick example. 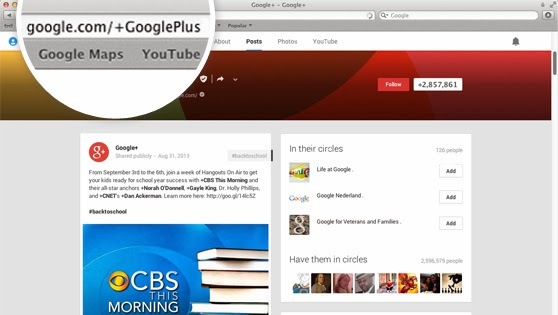 Currently, my Google+ profile is located at https://plus.google.com/104095608183213465861. If I were to get a custom URL, I could maybe changed it to plus.google.com/+GeoffDesreumaux for example, getting read of the numbers and make it much easier to remember for my friends.